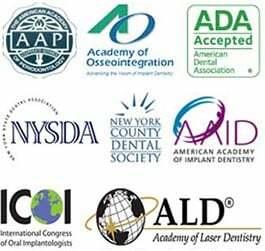 Dental implants NYC specialist Dr. Navid Rahmani is an internationally recognized, board certified periodontist, the best dental implants dentist and oral surgeon in New York. All dental implants procedures are performed on Upper East Side in our Midtown NYC dental center. Our NYC implants center uses only the best quality dental implants from Straumann. Dental implants can be made from titanium or zirconium. We use top quality medical grade titanium or titanium alloy, the same materials used for other bone implants and for orthopedic joint replacements. Tooth implant treatment will normally require several visits to our dental office over a period of a few months. If you require a bone graft or guided bone and tissue regeneration prior to dental implant surgery then you will need at least one more additional visit. However sometime it is possible to place bone grafting material at the same time as the dental implant, provided only a small amount of bone is required. Enjoy a new tooth without having to wait months. Your first visit will include a full consultation and examination with Dr. Rahmani as he will want to look at your teeth and jaws to assess your suitability and will talk with you to find out your aims for treatment. During this in-depth consultation, you will need to provide your medical history, including a list of medications currently being taken. It is important to make sure that any existing health conditions or medications will not interfere with the success of dental implant treatment so please make sure all the information you give to us is complete and up-to-date. A Cone Beam CT scan and dental x-rays and dental impressions are taken to provide a much clearer image of your dental health and to plan treatment. The CT scan will show the condition of your jawbone and will determine if bone grafting is necessary. 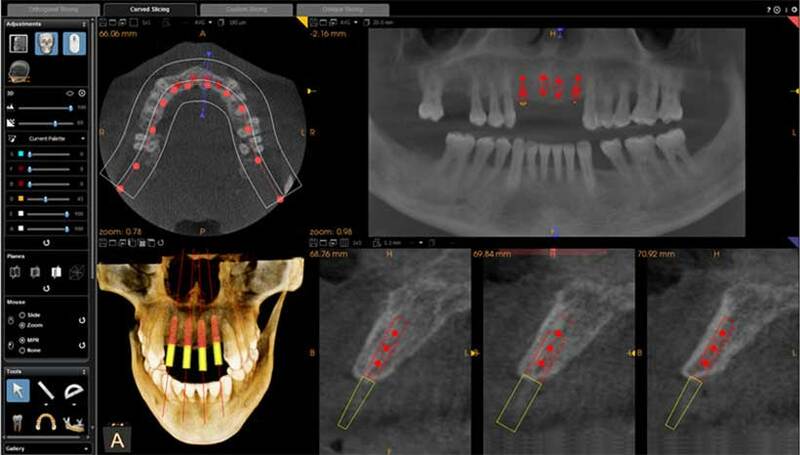 This advanced diagnostic and planning technology is also used to make your temporary prosthesis that will be worn while your dental implants bond with your jawbone. You will be provided with a written treatment plan, showing possible options and the costs. All possible dental implant treatments will be discussed with you and you will find Dr. Rahmani is very good at explaining procedures without using a lot of hard-to-understand dental terminology. Dr. Rahmani does allow plenty of time for these initial consultations and is more than happy to answer any questions you have about your implant treatment so you have all the information you need to make a fully informed choice about your dental treatment. Your dental implant surgery can be carried out at your next visit. After your initial visit, Dr. Rahmani will thoroughly analyze all the information gathered from your advanced diagnostic tests. He will know where your implants will be placed in your jawbone and will have made a surgical implant stent to guide him during surgery. Your temporary teeth will have been made and can be fitted after your implants are in place and surgery is completed. You can have complete confidence in knowing that everything possible has been done to ensure your dental implant treatment proceeds quickly, smoothly and comfortably. If you require teeth to be removed, then Dr. Rahmani will ensure they are extracted in a way that helps to preserve the empty tooth socket, often using a technique called an atraumatic tooth extraction. Using specialized tools, Dr. Rahmani can take out your tooth while causing minimal damage to the surrounding bone and gum tissue. This is a very gentle technique and will help to preserve the maximum height and width of your jawbone, ensuring your dental implant treatment is more successful and reducing the need for bone grafting. At this stage, it is also possible to place a small amount of bone grafting material before the dental implants are inserted. You can rest assured that your implant treatment will be completely painless as you will be given plenty of anesthetic to keep you comfortable. Computer guided surgery will ensure the process is quick. 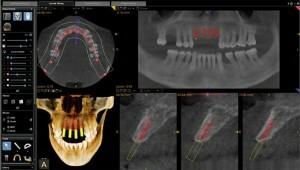 Your computer guided implant stent is placed over your gums, identifying the precise locations for each dental implant. It will only take a short while for Dr. Rahmani to prepare the site for the dental implant by accurately drilling the holes required for the implant post. The implant post is then inserted and tightened using special tools. If necessary the gums around the dental implant can then be stitched up, but sometimes the process is incision-free. At this stage, your temporary prosthesis can be placed. The purpose of your temporary prosthesis is to allow you to eat reasonably normally and to ensure you can smile and talk properly. We do take a lot of care when fabricating our temporary teeth, but it is important to remember your permanent teeth will look even better. Your temporary prosthesis will remain in place for several months while your dental implant fully bonds with your jawbone and will be replaced once Dr. Rahmani is sure osseointegration is complete. Your third visit to our dental office will be quite quick. We simply need to check your implant has fully healed before removing your temporary prosthesis to take detailed dental impressions of your dental implant. This is completely painless and you should not need any local anesthetic. Afterwards your temporary prosthesis will be replaced for one final time. The impressions are sent to our dental laboratory with your prescription so your new prosthesis can be made. We do liaise very closely with our dental laboratory to ensure you will receive a truly beautiful restoration made using only the best materials that conform to our strict quality standards. It will normally take approximately two weeks for your new prosthesis to be made. Your fourth visit is also pretty quick. We will remove your temporary teeth so your new prosthesis can be fitted and adjusted if necessary until it is perfect. We will show you how it looks to check you are happy with its appearance before permanently fitting it in place. This can be done by either cementing or screwing it onto your dental implant. Quite often, we prefer to screw a restoration in position as it is easy to remove it for any cleaning or maintenance. There is no need to worry that the screw holes will be visible as they are covered up with composite resin and will be invisible. If you are being fitted with a removable implant supported denture, we will show you how to insert it and take it out for cleaning and we always spend some time showing everyone how to look after their new teeth.